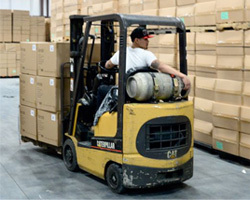 Fulfillment Outsourcing - Coast to Coast to Coast Fulfillment, Inc.
A full-service fulfillment outsourcing company, Coast to Coast Fulfillment, Inc., provides back-end third-party logistics (3PL) on behalf of marketers, manufacturers, importers and exporters. Fulfillment Outsourcing - Why outsource fulfillment? The key reason to outsource your company's fulfillment operations is to allow you to focus on your core business - what you do best - to enable your business to grow. When you outsource your fulfillment operations with Coast to Coast Fulfillment, you will have access to a warehouse, order-processing equipment, computer and software systems, and everything required to run an order-processing and shipping operation. Fulfillment outsourcing gives you all the benefits of a full-service warehouse operation - without any of the fixed overhead costs. You only pay for fulfillment services when you generate sales. You will have lower overhead, fewer people to manage, and more time and resources to focus on expanding your core business. An experienced product fulfillment outsourcing company such as Coast to Coast Fulfillment, Inc. has strong industry experience. We have already refined our order processing, packaging, shipping, and data-handling operations for a wide variety of products. By outsourcing your fulfillment, you can focus on what you do best, whether that is sales, marketing, advertising, manufacturing, or improving or expanding your business in other ways.